One of Russia's most well-respected foreign investors, private equity baron Michael Calvey, has run the Russia focused investment fund, Baring Vostok, since 1994, and has never shied away from touting his ability to work with government officials. Now, he's sitting in a Moscow jail cell, and, as both Bloomberg and the Financial Times have reported this week, other foreign investors are suddenly panicking, wondering what this means for their business in Moscow, or if they too could be subject to arrest and scrutiny of the country's KGB-successor agency, the FSB, if they are ever embroiled in what should be a civil business dispute over a few million dollars. Calvey, a fluent Russian speaker who founded the Russia-based private equity, he has been one of the few foreigners to hang on to his business in Russia following the 2014 blacklisting of Russia by the west after the escalation in hostilities with Ukraine. While Russia has had some success attracting investments from China and the Persian Gulf states, the pullout of US investors has led FBI to shrink from $27.1 billion in 2017 to $1.9 billion last year, according to the Russian central bank. That's down from $79 billion in 2013. Some of the more adventurous US-based private equity funds like Blackstone and TPG ended their attempts to invest in Moscow after the US sanctions. But through it all, Calvey - who is a US citizen - stuck around, continuing to invest in small and medium-sized companies - his firm's specialty. In December of 2014, the FT reported that Calvey had said he saw investment opportunities amid the chaos. 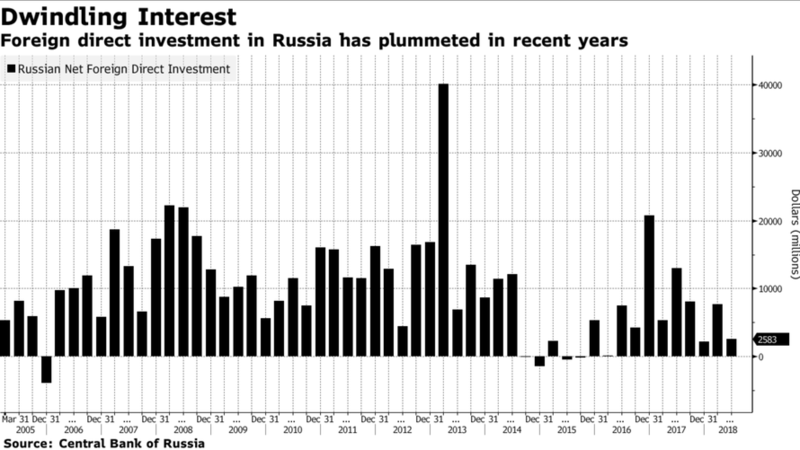 "We are practically the only people still buying Russian assets, so it seems like it could be a good cycle for investment,” he said. "Of course, we need to convince our (investors) to be patient." 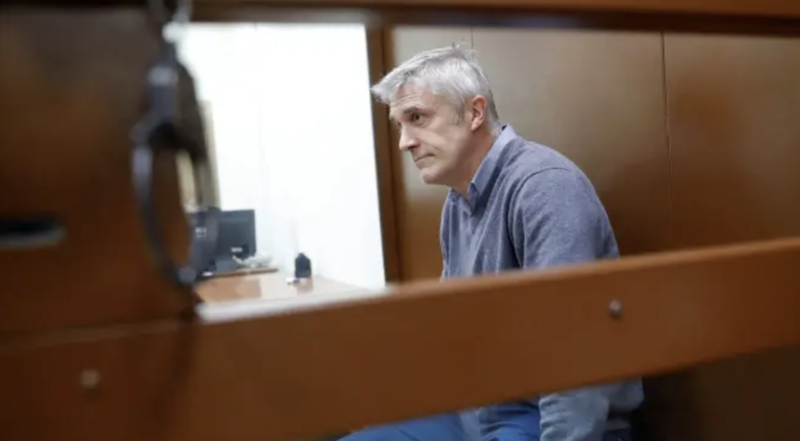 Calvey said that he and five other Baring partners had conspired to defraud Vostochny Bank, a Baring-owned top-30 lender that focuses on Russia’s Far East, of $38 million. Calvey, of course, has denied wrongdoing, telling the court that the charges were part of a long-running dispute with minority shareholders Artem Avetisyan and Sherzod Yusupov over control of the bank. The arrest came less than a week after Yusupov filed a complaint with the FSB about Calvey, though he and the agency have denied that the charges are linked to the complaint. Calvey’s legal troubles stem from a dispute with other shareholders at Bank Vostochny Express, a consumer lender that the fund bought a stake in almost a decade ago in a bet on the rising retail market. The bank ran into trouble in recent years as the economy fell into recession and was merged with one owned by Artem Avetisyan, a Russian investor known for ties to the security services and his role in government advisory panels on improving the business climate. When the central bank late last year ordered the bank to come up with more capital to cover its weak loan portfolio, Calvey’s fund and the other shareholders couldn’t agree on who would put in the equity. Baring Vostok sued the others in London, accusing them of stripping assets from the bank they contributed to the merger. Avetisyan didn’t respond to requests for comment. Calvey and three other Baring Vostok employees, as well as two others, were detained Friday. The case is being handled by the Federal Security Service, the main successor to the Soviet KGB. Russian President Vladimir Putin, who has met with Calvey during events for foreign investors, has said he is following the case "closely." Despite several influential Russian figures speaking out to defend Calvey, a judge ordered that he be held for two months. Sberbank CEO Herman Gref, a longtime Putin confidant, said he hoped the charges were a "misunderstanding." Calvey has long been respected for his connections in Russia, even hiring a former Soviet cosmonaut to work part time for his firm to help them navigate local risks surrounding their deals. Now, Calvey's detention has earned him comparisons to Bill Browder, the hedge fund manager who lobbied for the US to pass the Magnitsky Act, and who has been a target of Russian President Vladimir Putin's vitriol. The news, which prompted a selloff in Russian stocks as foreign investors pulled money out of the country, has prompted some to wonder what the long-term ramifications for Russian assets - or even, more broadly, US-Russia relations - might be, particularly after Russia detained another US citizen late last year on suspicions of being a spy.